I tackled three new recipes from Whole Food Kitchen this weekend, in addition to making my second batch of the easy, delicious granola. On Friday night, I made the banana nut cream with berries. It was good, but different. Not exactly whipped cream, but it was good. I used frozen berries, and I’d use fresh next time. I have this thing against cold fruit. I really prefer it to be room temperature. Next up were the Peanut Butter Chocolate Chip Granola Bars (made with the aforementioned granola). These are so yummy, but I’ve got to do a better job of smooshing them down next time. These crumble as soon as you cut them, so they aren’t exactly bars. Saturday night R put on a beautiful recital at our local Unitarian Church. I took M, even though it started at bedtime. We got there a little early and she did a bunch of running around in the sanctuary and then settled right in once the music started. She is such a champ. She stayed awake through the whole thing and was pretty quiet, all tucked in to the Ergo on my front. Her outbursts were mostly limited to things like, “Daddy, Bass!” I did end up standing at the back the whole time, as she got antsy anytime I sat down. It was kind of nice to have a nice full room view and see everyone enjoying the beautiful music. Here’s a nice video of one of the pieces he performed. 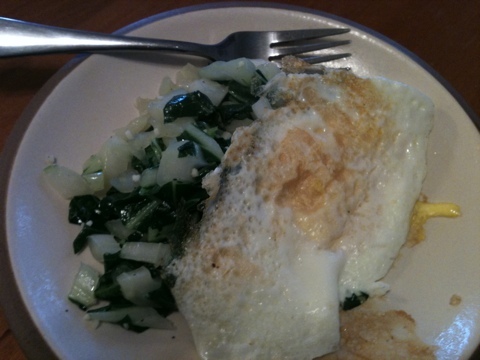 And finally we had a lovely Sunday morning breakfast of sauteed bok choy with a fried egg. I skimped on the garlic. I should know there’s hardly ever too much garlic, but I am always conservative with it. It was fun to try bok choy, and we have a lot leftover, so we’ll be eating it all week. I ended the weekend with a book club brunch this morning and I’m off to the Whole Food Kitchen Nourishment Circle tonight. Life is good!